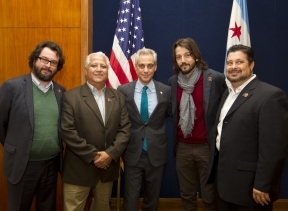 Mayor Rahm Emanuel met with Paul Chavez, the son of civil rights leader Cesar Chavez, and director Diego Luna who directed the new film, Cesar Chavez last Friday. The National Museum of Mexican Art and the Cesar Chavez Foundation hosted a pre-screening of Cesar Chavez in Chicago last Friday evening. Photo Caption 1- 2: Chicago Mayor Rahm Emanuel meets with Paul Chavez, President of the Cesar Chavez Foundation and film director Diego Luna.